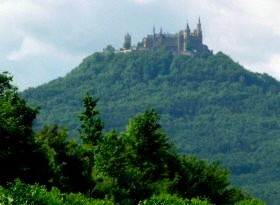 We made a trip to the southern portion of Germany, east of the Black Forest but not quite as far south as Baviaria. For the first part of our trip, we stayed in Rothenberg, a medieval city which still has the wall intact all the way around. 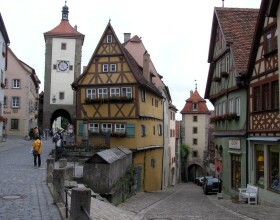 We then moved on to the Schwaebian region, or the Swaebische Alb. It is a mountainous area similar to the Ozarks, but probably geologically younger. Lots of tall hills rise out of the gently rolling hills, and nearly every peak or ridgline had a castle on it. 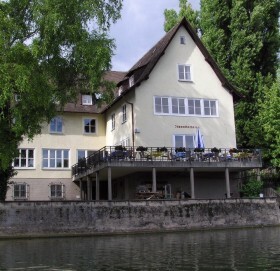 We stayed in a youth hostel in Tübingen, a centrally-located college town, and travelled to two castles from there. 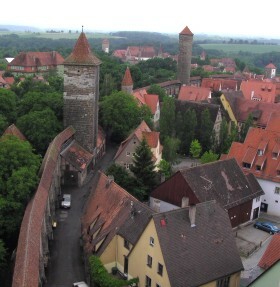 A look from about 10 stories up in the Roederturm (tower) right by our hotel. There were towers every few feet along the city wall, seen on the left. Much of the eastern portion of the wall was destroyed when Rothenberg was bombed for morale reasons in WWII, but was rebuilt to the detail. 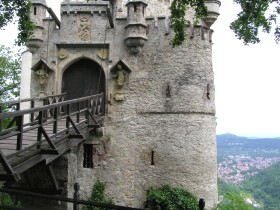 Roeder Arch and Markusturm, one of the towers on the original wall built in the 11th century. 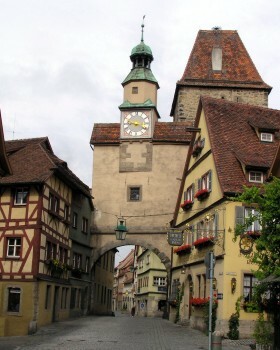 A highly photographed intersection, with two towers (built in 1204) visible along an inner wall. 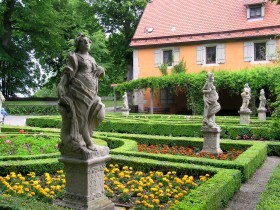 Statues in the castle gardens on the west side of the city. 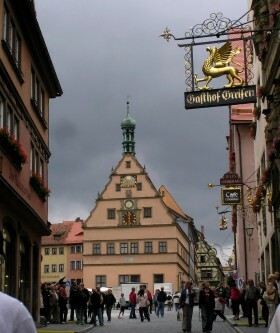 A view of the City Councillor's Tavern with the ornamental sign for the Golden Griffon in the foreground. Nearly every business or gasthaus had an ornate wrought-iron sign, which we found can cost about $5,000 up to to $15,000! 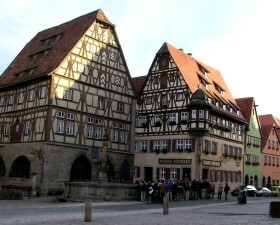 Some late 14th-Century half-timbered buildings across from the market square. 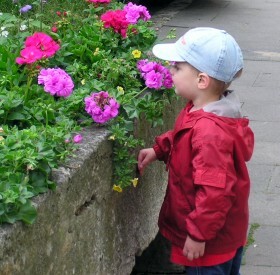 Even Riley did his best to "stop and smell the roses" on this trip. There were old stone watering troughs every few paces filled with beautiful geraniums and miniature petunias. He asked me to take a picture of him smelling the flowers. 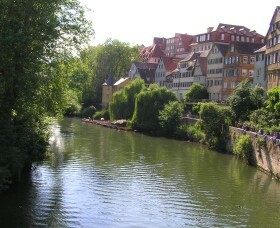 A famous view of the lazy Neckar River (which also flows through Heidelberg) from a bridge near the old part of Tuebingen. The church alone was built in the 15th century. The youth hostel (Jungenherberge in German) we stayed at for two nights. 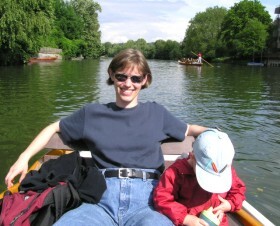 Riley and I relaxing in the back of a row boat we were able to rent. We brought bread and corn flakes along to feed the ducks, and Riley once had about fifty of them crowded around the boat! 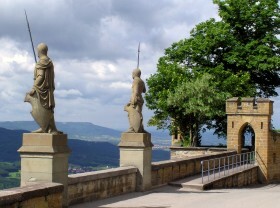 Hohenzollern was the ancestral home of the Schwaebian princes, and also had ties to the Prussian kings. It was a monster perched high on a mountaintop. Sentinels looking out over the plains way below. Those tiny dots by the wall are villages. 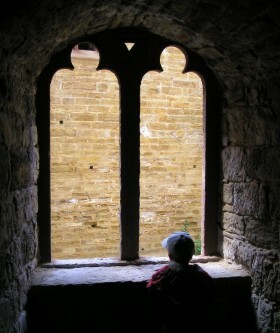 Riley looking out a window from a tunnel that spiraled upward to the main courtyard. 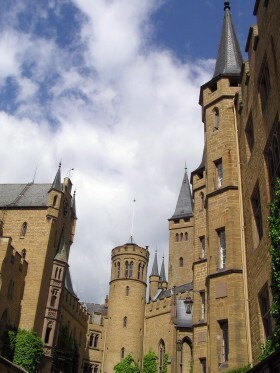 A view from the courtyard. I just couldn't get it all in one shot! 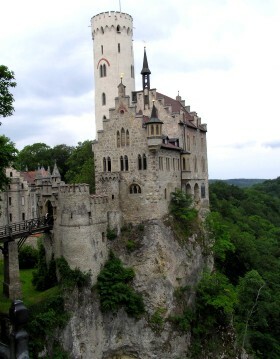 Lichtenstein castle was perched right on top of a large limestone outcropping, with a huge dropoff beside it. Here's a view that shows just how high it is. 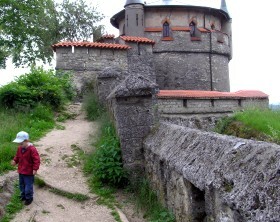 Riley playing beside the older castle, which was inhabited by 1180. 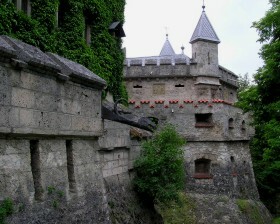 A combination of old and new fortress walls.